I am fortunate to code some go at my new assignment. I had some two weeks with the language last fall but apart from that it is new unmarked land for me. It is a nice language that is easy to learn and does things in very different ways. You get started really fast but with that nagging feeling that there is much more to learn around the corner. 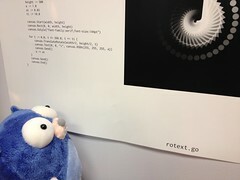 I suspect that you can be really productive in go. If you like your strong types and a bit lower level than normal you will get back performance only matched by C and a robust piece of code. I discourage writing test in the way you seem to have desire for. It’s not by chance that the whole stdlib uses the, as you call it, “verbose” way. Based on your update, that is not idiomatic Go. What you are doing is in essence designing a test extension framework to mirror what you get in the XUnit frameworks. While there is nothing fundamentally wrong, from an engineering perspective, it does raise questions as to the value + cost of maintaining this extension library. Additionally, you are creating an in-house standard that will potentially ruffle feathers. The biggest thing about Go is it is not C or Java or C++ or Python and things should be done the way the language is constructed. Works for me. I’m gonna use that for a while and see how it feels. I will - however - try to grasp the go way as I go and if needed will change my mind in this matter. Expect more posts about go during the fall.